The lids were smuggled into Israel in order to procure an authentication certificate, which would then allow the dealers to sell them to collectors. The present story is exactly the kind of dramatic case the Israel Antiquities Authority (IAA) loves to publicize, in this instance involving some very high-profile objects that originated outside the country. But one must always look at the bigger picture: How many lesser but still desirable finds — intact pottery, oil lamps, coins, you name it — are illegally dug up in Israel and channeled, through middlemen, into the hands of licensed dealers or directly to collectors? To the extent that it happens, it is doubly so over the Green Line, in the Occupied Territories. There, where the looting is indisputably carried out by the Palestinians themselves, there is arguably less appreciation for cultural heritage and the need to protect it, a weak economy with high unemployment prevails, and enforcement is especially lax (the Palestinian Authority has no control whatsoever over “Area C”, which constitutes over 60% of the West Bank). And, the looted objects are, by all accounts, easily smuggled into Israel or Israeli-occupied East Jerusalem, obviously with the help of accomplices on the other side. Beyond the loss of the artefacts themselves and any information they might have conveyed to experts, the sites from which they were taken are left heavily vandalized and rendered virtually useless for any kind of proper, controlled exploration. An acquaintance of mine deals with these issues intimately, on a professional basis, and the problem is very real. Shai Bar-Tura of the Antiquities Authority’s Unit for the Prevention of Antiquities Robbery said that starting April 20, Israel will only allow the import of antiquities certified to have been legally exported from their country of origin. “The new regulation will provide us with the tools needed in order to prevent the importation into the country of antiquities that were stolen or plundered in other countries, thus enabling us to thwart the international cycle of robbery and trade in stolen archeological artifacts,” he said. Well, okay, but where have they been for the past 34 years, since Israel’s antiquities laws went into effect in 1978? The kind of monitoring and regulation they now anticipate imposing seem like pretty basic elements of any kind of effective enforcement, at least to me. And, again, antiquities coming into the country from overseas surely represent no more than the tip of the iceberg, maybe the tip of the tip (and those coming in from the Occupied Territories may be the iceberg!). And here’s an underlying question which I think deserves ongoing scrutiny (and I don’t claim to have the answer): Does a “legal” antiquities trade like Israel’s serve as a means of control over looting and trafficking — or is it part of the problem? During the Exodus — the real one — the remains of Joseph, who had served as a high official in the court of Pharaoh, were carried out of Egypt to be buried — 40-plus years later, as it turned out — at Shechem (follow the chain: Gen 50:25, Ex 13:19, Josh 24:32 and Heb 11:22). Final thought question: Would Joseph’s bones (or mummy?) 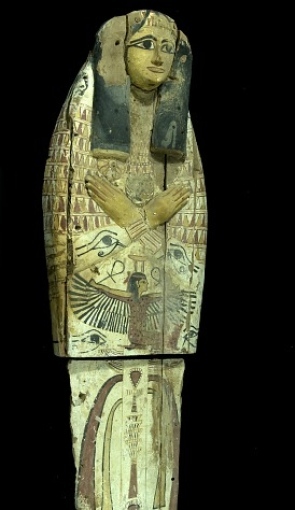 have been transported in their original coffin, perhaps very much like one of these? UPDATE / 07 APR 2012: On the topic of the “legal” antiquities trade and the looting of antiquities, here is a very interesting web posting that tends to confirm some of what I have suggested above. It is by a US-based academic, Dr. Morag Kersel, who has done research on how the system really operates. The comments following the post are important as well since, among other things, they point to yet other resources. Dr. Kersel observes that Israel’s 1978 antiquities law specifies what can be legally sold by collectors or licensed dealers: shop inventories that existed in 1978, and any object from a private or museum collection that was acquired before 1978 — and that’s about it. That was 34 years ago. Everyone who believes that those categories represent the items sitting out there on dealer’s shelves, raise your hand… Right. This entry was posted in Antiquities, Israel-Palestine Scene, Issues in Archaeology, JERUSALEM, Occupied Territories and tagged antiquities trade, Archaeology, coffin lid, Egypt, Israel Antiquities Authority, Jerusalem, looting of antiquities, Old City. Bookmark the permalink. When the forgery trial began, the IAA announced that their investigation led them to the “tip of the iceberg”: an organized group of forgery artists. You repeat the same terminology above. Now that the iceberg has melted, & we see that the figurative “iceberg tip” amounted to a few drops of water (i.e., the minor charges on which Golan was convicted), please consider discarding the hyperboles, as they only weaken your otherwise valid points. Thanks for acknowledging the validity of my point. But hyperbole has one great advantage: It get’s people’s attention! Seriously, we should be sure not to confuse two related but very different phenomena (they both constitute criminal activity): (1) looting and trafficking in authentic but illegally extracted objects and (2) producing and trafficking in forgeries. The article and my comments deal with the former, and the Oded Golan business entirely with the latter. In the high-profile Golan et al. case, I do think the IAA overstated the extent of the problem — the forgery of antiquities — and they undeniably overplayed their hand. But the looting and destruction of actual ancient sites, and the resultant trafficking in the objects, is a very real problem and goes on every day. Dr. Kersel’s research should certainly not be dismissed as anecdotal or unscientific: After all, how does one uncover the truth about such a closed, hidden system that nobody wants to talk about or even acknowledge exists? There’s no data to mine here. No, you interview people who have inside information (and hopefully no particular axe to grind), with the promise of anonymity — which, yes, can make for sparse footnotes! Tom, I spent all day yesterday studying 4 articles that Dr. Kersel gave me last week. I prepared a lengthy, 12,000-character rough-draft response that I submitted to (ASOR Blog editor) Dr. Vaughn for publication consideration. Not sure yet if I’ll post my review as comments to her original blog article or as a new article there or elsewhere, but because I know this subject interests you, I’ll give you & your readers a special preview. Sorry, but that’s 100% grade-A tripe (a mild metaphor considering the seriousness of the subject). Even if the archeologist had allowed his/her identity to be revealed, the fact that he/she admitted to not being sure whether the artifacts were looted demonstrates the worthless, unscientific nature of Dr. Kersel’s research on this subject. If she wanted to be taken seriously & contribute valuable data to the discussion, she would’ve documented this experience with photos & covert markings on the jars to positively identify them at the shop, & then confront the shop owner along with the IAA/police. Again, this is just one example I’m providing here as a teaser. In response to your other comment about the IAA, I would refer readers to the reply I gave to Owen Chestnut on the ASOR Blog about government agencies. One more thought, just an impression: It sometimes seems to me that the IAA harbors a towering ambivalence about the “legal” antiquities trade: They are mandated by law to license and monitor this system, yet, in the end, they really don’t like it very much and would just as soon shut it down. Comments?